Payment schedules break out your orders into one or more invoices based on your rules. 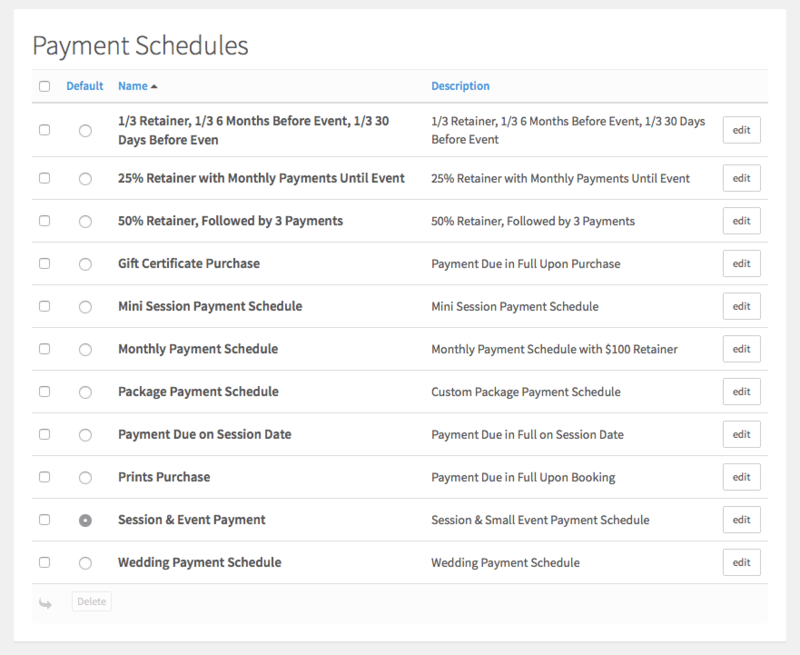 When you book a client’s order, whether through a quote or on the fly, you are given the flexibility to automatically generate invoices for their payments due based on a custom payment schedule. You can create an unlimited number of payment schedule options in your account at Settings › Payment Schedules. When you create a new payment schedule you’re given 4 options: one payment, multiple payments, monthly payments, or custom. Note: If your payment schedule has due dates based on the job date and you do not have a dated primary session scheduled (even tentatively) at the time the order is approved by the client, they will be prompted to pay the entire order balance in full at the time of booking. Additionally, any invoice in the payment schedule that would be past due on booking will also become due at the time of booking. On the Payment Schedules settings page you’ll notice you can select and delete your payment schedules you no longer need, and you can set your account’s default payment schedule. When generating a new order on a job, the system will automatically default to this schedule unless you change it by selecting another from the payment schedule dropdown menu. On all payment schedules, you can set additional restrictions regarding the client’s ability to pay online. If the option to restrict online payments is set for one or more of their required payments, the client will be directed to one of your other payment methods you have set up, such as Payment by Check, when they view their invoice. If you'd like to change this restriction for a specific order at a later date after booking, you can do so by viewing the order in Táve, selecting the Edit Invoices button, and editing the selection in the Payment Restrictions dropdown at the very bottom of the screen.